Whether you’re getting ready to pick out your first set of glasses or you’re on pair 20, there are a few things you need to account for so you can pick the best one for you. 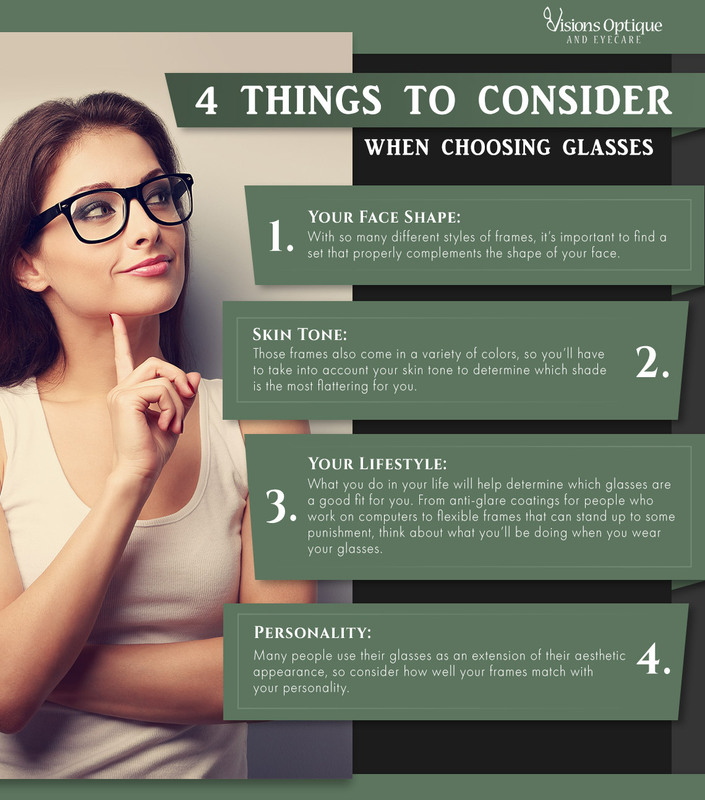 Today, we’re going to discuss four things you should consider when you’re choosing your glasses. 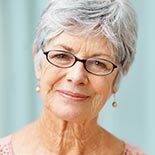 If you would like some assistance in picking out the best pair of glasses for you, call Visions Optique in Scottsdale to schedule an appointment with an experienced and knowledgeable optician. People have different facial structures and glasses, similarly, come in a variety of different shapes. What might surprise you is how the shape of your glasses can either complement or clash with the shape of your face. We took an in-depth look at how to pick the best style of glasses for your face shape in a previous blog if you’d like a more detailed explanation of this point. At its most basic level, you’ll want to stick to opposite shapes (i.e. square or rectangular frames for round faces, round frames for square faces, etc.) to get the best look. 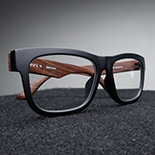 Shape isn’t the only thing to take into consideration when choosing your new frames. Everyone has different skin tones, and just like finding the right color to wear for clothing or makeup, so too do you need to find a frame color that works well with your complexion. This is more important than hair color because as you know, your hair color can change. For warm skin tones, choose frames such as light tortoise or shades of brown, while avoiding pastels, white, and black frames. Cool skin tones benefit a lot from silver, black, dark tortoise, and statement frames like pink or blue. This is potentially more subjective than the previous tips but is just as important. There are different styles of glasses which are suited to specific activities, so you should think about what you’ll be doing when you’re wearing them to choose the ones that make the most sense. This extends past just your hobbies, as your work may require certain safety features. If you spend a lot of time in front of computer monitors or TV screens, choose an anti-glare coating for the lenses to protect your eyes. If you’re very active, choose flexible frames that can take a bit of punishment. All of these things add up to something people can use as an extension of their personality. Think about what tone you want your glasses to convey, from professional to fun, and you can find frames that fit your mood and aesthetic. Picking out the right glasses can be difficult, but it’s much easier when you have a professional helping you out. Call Visions Optique in Scottsdale today to schedule your appointment and let us show you the way. We hope to see you soon!